Visit this fun festival on the second Sunday of each month from March through December! It’s a friendly, unique arts festival between the 400 and 500 blocks of Prince George Street—and continues in each direction along N. Boundary. Presented by the Blue Talon Bistro, the festival features more than 75 artisans, as well as local authors of books for children & adults. You’ll find all kinds of art forms: from classic and colonial to abstract and upcycled; vintage boutique kids’ clothing, paintings, pottery (hint, hint), woodworks, glass, jewelry, photography, and more! The children’s activity tent is sponsored by Artfully Yours & Grow Happy Studio. Jay has been in the mud since his wife, Becky, bought him a class at a local pottery studio in 1999. Since his pottery studio is out back, his commute to work in the morning is only a hop, skip and a jump away. 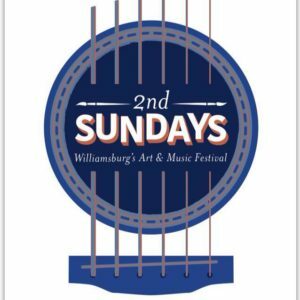 We will be at the 2nd Sundays festival on November 11th. You can get more information on the Events page.